"A tenor who is molto forte is Angelo Lo Forese who, when I last checked, was still performing at the age of 91. Here he is from a long-ago recording with a convincing throb in his voice that might seem corny now but was plausible a couple of generations ago. This is what cultists look for when they try to hear what Toscanini might have heard. Lo Forese was born in Milan in 1920. He began his studies in 1938 and stopped in 1941 when he fled Italy for Switzerland during World War II. He returned to Italy after the war and made his début, as a baritone, in PAGLIACCI as Silvio. He continued his studies, including lessons with tenor Aureliano Pertile who became a star at La Scala in 1916 and at the Met in 1921. Lo Forese’s tenor début was in the demanding role of Manrico, IL TROVATORE. It is music he still sings today. His rendition of ‘Di quella pira’ at the age of 90 is forceful, with impressive high notes and more fidelity to the score...."
"Though not possessing the vocal opulence associated with other star baritones of his era, Renato Capecchi was no vocal underachiever, and his feel for the Italian language and searching musical intellect made him one of the most valued singers of his time. 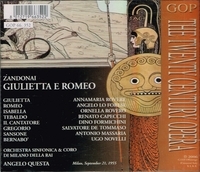 His recorded performance of RIGOLETTO stands with the best for its mastery of the role's subtleties and dramatic truth. Likewise, as Rossini's Figaro, he captured both the quicksilver and pragmatic sides of that buoyant character. Capecchi's repertory was huge, encompassing hundreds of roles; as the years passed, he increasingly concentrated on the buffo parts, and eventually undertook directorial assignments, allowing him to share his theatrical fluency with other singers."